All of Facebook’s ads, its vast data collection networks, its many products, and its cute stickers and emojis boil down to one single number: $6.09. 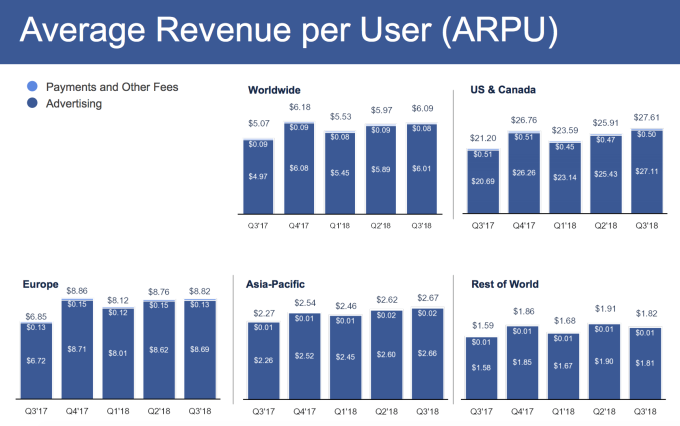 For the last quarter, Facebook reported an average revenue per user (ARPU) of $6.09. This means that the each of Facebook’s over 2 billion users earned the social network an average of $6.09 (Rs. 450) over the period. The earnings varied dramatically based on where the users were located — users in the US earned Facebook an average of $27.61 (Rs. 2,041), while users in Asia Pacific, which includes India, earned it just $2.67 (Rs. 197) per user. The earnings came mainly through ads, and in developed markets, a small portion came through direct payments and fees for using some of its niche services like food ordering. These numbers aren’t large by themselves — Facebook earns around Rs. 200 a quarter from its Indian users, but Indian probably spend more money on phone recharges, and services like Netflix, which can cost as much as Rs. 600 a month. But what makes Facebook the world’s fifth most valuable company is its sheer number of users. Last quarter, Facebook had 2.27 billion monthly users. With the entire world’s population currently hovering around 7.6 billion, this means that nearly 30% of all human beings on earth used a Facebook product at least once a month. Even more impressively, nearly 1.5 billion people — one fifth of humanity — used Facebook every day. Analysts, however, aren’t pleased with Facebook’s numbers — its stock is down 3% since they were released yesterday. Investors are concerned that there might not be a lot of headroom for Facebook to grow, and its numbers are showing growth that’s slowing down. The addition of new users for the last quarters was the second slowest in the company’s history, and revenue growth slowed down too — revenue grew at 33% year-on-year for the quarter, while it had grown at 49% the quarter before, and 56% the quarter before that. What’s worse is that Facebook’s growth has plateaued in its most lucrative markets. Facebook makes 10x more money from its US users as compared to its Asian users, but growth has all but ground to a halt in developed markets. Facebook added just a million new users in US and Canada, and even ended up losing one million users in Europe. 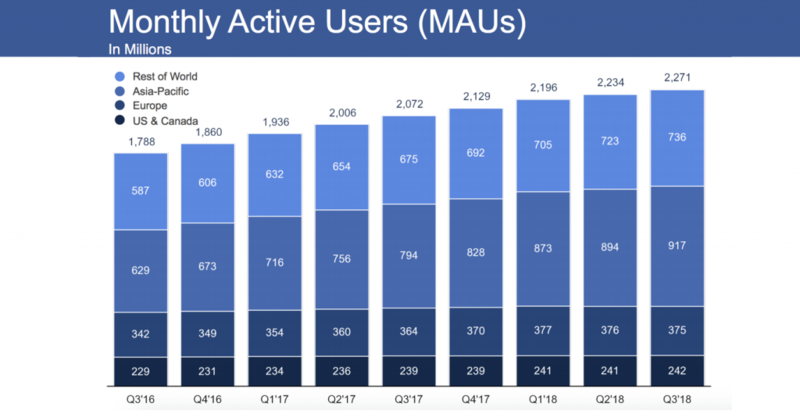 With new user growth coming only from developing markets, it’s expected that Facebook’s revenue growth will slow further in the quarters to come. But for now, browsing cat pictures and engaging in heated political debates is adding $6.09 per user per quarter to Facebook’s top line.